04/27/2018 | Articles, World in WAIMH | Puura, K., Malek, E., Berg, A. Picture from the community clinic setting in Western Cape, South Africa. Photo by Astrid Berg. 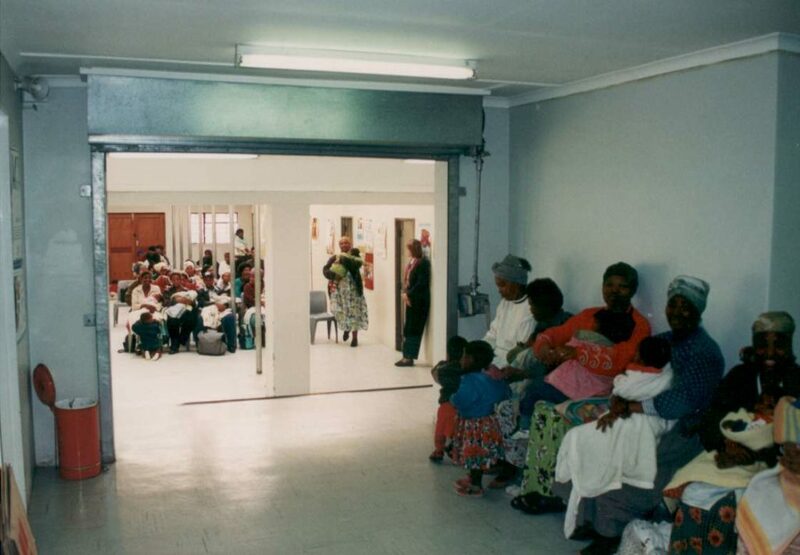 Since the advent of democracy in South Africa considerable advances have been made in health care delivery. Financial and human resources that were previously concentrated in tertiary, academic sections have been channeled into primary health care setting and in this way have enabled an almost universal access to basic health care. The Western Cape is one of South Africa’s nine provinces with a population of over six million people with over half a million being under the age of 4 years. Every mother and infant are recorded on a central system and receive documentation on the birth of the child. These documents that are currently under review, provide an opportunity to track the infant’s development from a holistic perspective. Traditional screening tools have focused almost exclusively on physical development. Physical growth is an accepted indicator of child health status and this is inevitably linked to caloric intake; the weighing of infants is thus part of the well-baby clinic visits. However, in addition to nutrition received or the lack thereof, it is known that maternal depressive symptoms are associated with a 40-50% higher estimated risk for faltering weight (Surkan et al, 2016). This finding was highlighted in a clinical survey of the University of Cape Town Parent-Infant Mental Health Service (Berg, 2012) and supported the notion that more than food is needed for adequate growth. In addition to the mental health aspects as they relate to faltering weight, there is a general and growing appreciation of the importance of the beginnings of life. Neuroscience has demonstrated the rapid growth of brain structure and function in infancy, making this time the most plastic period of human development (Gao et al, 2016). The counter-point of plasticity is susceptibility. The problems our society and many other societies are facing such as the high rate of crime, substance abuse, and domestic violence can be traced back to adverse early experiences. It thus became imperative for the authorities in the health sector to acknowledge that the vision of “Quality Health for All” starts at the very beginning of life, not only from a physical, but also from mental health point of view. In parallel to these developments there occurred a conceptual shift on Governmental level to move “from managing the consequences of the burden of disease to improving wellness”; this shift mirrored current trends in the mental health field as reflected in the burgeoning of interest in the promotion of a healthy start to life. Paying attention to infants and young children and to their primary relationships is possibly the most important ‘upstream factor’ that impacts on health and mental wellness in the whole of society. It was within this context that a multi-disciplinary working group – The Parent Infant Child Health and Wellness Working Group (PICH WG) was established in 2013. It was mandated to drive the agenda for the Western Cape Provincial First 1000 Days Initiative which is a lead project of the Provincial Strategic Plan for 2014-2019, under the Provincial Strategic Goal 3 Increase wellness and safety and tackle social ills. To supply scientific evidence that demonstrates that there are economic benefits to investing early in the life span. Unifying various sectors of the administrations will enable a broad based inclusive message about the importance of the beginning of life to be delivered to all population groups. Besides the endeavor to work together across systems, there is the challenge of delivering the message in a manner that is respectful of cultural diversity. It is in this nuance that true transformation is manifest. Within the Department of Health, awareness of the importance of the First 1000 Days has led to a better understanding of the need for providing comprehensive services during pregnancy inclusive of maternal mental health and psychosocial support services as well as providing support for parental readiness and recognizing the important role of fathers – key domains for fostering parent-infant attachment starting early during the prenatal foetal/infant developmental stage. The First 1000 Days has thus provided a natural umbrella to also unify previously siloed departments also within the Health Department. Beyond this, it has brought home the recognition amongst health workers that an empathetic approach is essential in working with pregnant mothers, given a better understanding of the contextual factors surrounding the pregnant mother that in turn impact on the developing infant both pre- and postnatally. In South Africa, the National Road to Health Book is issued at birth to all infants. It is a patient held record which records essential basic health information about the baby, including birth, immunization and Vitamin A, growth parameters, development, oral health, and hospital admissions. It also contains age-group related feeding recommendations and play and stimulation messages. A complementary tool has recently been developed called the postnatal checklist tool to assist with implementation of a Western Cape Postnatal Care Policy, which provides guidance for care of mothers and infants in the first 6 weeks after birth of the baby. A copy of this tool is added to the Road to Health Book after birth. The Postnatal checklist has two components, one for the mother and one for infant and both are completed at various set time points during this 6 – week period. The 5 questions from the Basic Infant Mental Health Screen (BIMHS), as described further below, have been incorporated into the Post Natal Care tool (in partnership with Edna Arends, Western Cape Provincial Maternal and Newborn Health Program). A training guide for staff on the background to these questions and guidance on their implementation is being developed. These tools will include a checklist with key questions and will be complemented with more detailed parental questions and guidance. Care has been taken to align these processes to a broader initiative to develop comprehensive paediatric clinical guidelines for primary health care clinical practitioners (Practical Approach to Care Kit (PACK-Child), Knowledge and Translation Unit, University of Cape Town), which has included the infant attachment screening questions as well as guidance on parenting information. The additional questions are the result of a collaboration with colleagues in Finland where infant mental health has been integrated into primary care. The background to each requires further elaboration. Screening infants for signs of somatic illnesses has been established as a part of primary health care in many countries and has been shown to be an effective way for improving health of infants and young children (e.g. Köhler 1991). Awareness of the importance of mental health early in life has been steadily increasing ever since 1970s, and tools for detecting psychological distress in infants and young children have been developed as a consequence (e.g. Guedeney, Puura and Matthey 2013). Finland is one of the Nordic countries with a well-baby clinic network that has long been developing strategies and tools for screening for both physical and mental health for infant and young children, and also studied the feasibility of screening in primary health care (Puura et al. 2010, Kaukonen et al. 2010, Borg et al. 2014). Based on findings of earlier studies, The Basic Infant Mental Health Screen (BIMHS) was developed as a joint effort of Drs. Kaija Puura, Astrid Berg, Elmarie Malek and Pälvi Kaukonen. It is a simple and short tool to be used to screen for the basic markers of infant mental health globally, as the items most likely are not affected by cultural differences, at least not during the first year of life. The first two items are simple questions of whether the parent is worried about the child and how the parent is feeling herself/himself. The question about parental worry was derived from a previous study, where the question: “Overall, do you think that your child/this child has difficulties in one or more of the following areas: emotions, concentration, behaviour or being able to get on with other people” alone was found to be quite reliable as a screening question for developmental or psychological problems in young children in a survey done in primary health care in Finland (Borg et al. 2014). For the BIMHS the question was rewritten to “Are you worried about your infant/child?” and with a positive answer from a parent, further questions are to be used to clarify what sort of worry the parent has. Parental mental health problems like anxiety and depression, have been associated with poorer parent-infant interaction and infant distress in several studies (e.g. Mäntymaa et al. 2008, Luoma et al. 2013). The second question of the BIMHS comes from a study by Puura et al. (2010) where infants aged 4, 8 and 18-months of age were screened in primary health care for infant social withdrawal symptoms. In this study, a question “How has your mental health been during the past 12 months?” was quite reliable in finding parents who had not been well psychologically, and whose infants showed symptoms of infant social withdrawal (Mäntymaa et al. 2008). For the BIMHS the question was reformulated into “How have you been feeling?” to help tap any symptoms of anxiety, depression or other mental health issues. It is also a way to show the parent that the primary care worker is interested in the parent’s well-being. The third item on the BIMHS is weighing and measuring the child for two reasons: abnormalities in weight and height can be markers of malnutrition or somatic illnesses, but growth can also be slowed as a result of psychological distress (e.g. Patel et al. 2004, Walker et al. 2007). The two further items: infant’s eye contact with the parent and the health care worker and the shared pleasure between the infant and the parents are markers of both parent-infant interaction and infant social behavior. Eye contact between an infant and the parent or examiner has been previously connected with good-enough early interaction and healthy infant development in studies from several countries (Matthey et al. 2005, Dollberg et al. 2006, Lopes, Ricas and Mancini 2008, Puura et al. 2010; Puura et al. 2013). Shared pleasure as defined by eye contact and simultaneous smile or laughter between a parent and an infant has in recent studies been found to be associated with good parent-infant interaction and less emotional problems in early childhood in samples from Finland and South-Africa (Mäntymaa et al. 2015, Lachman et al. 2016, Puura et al. in press). The final item about the possible worry of the primary health care worker was also found to be a good predictor of possible problems of young children in the study of Borg et al. (2014) and was therefore included into the BIMHS. For each item of the BIMHS we created some additional questions to be asked, should the parent tell about problems or should the primary care worker detect a problem in the growth or social behavior of the child. These questions were meant to help further discussion on the possible problem and can be modified and added to. As we wanted the BIMHS also to offer help for the primary care workers in what do with the possible problems, Drs Berg and Malek also created action guidelines. These guidelines naturally can and must be adjusted according to the possibilities and services available in different sites. Prior to this project, the BIMHS has not been in clinical use, but it has been mentioned as an example in an article meant for general practitioners on what to pay attention to when screening for mental health problems of young infants and their parents (Puura and Tamminen, 2016). Incorporating a new element into existing protocols is often met with resistance. This is in large part due to a heavy patient load in the primary health care setting, understaffing and thus not sufficient time or motivation to enquire about mental health problems. In addition, nurses and community health counsellors often feel ill-equipped to deal with the problems that might become evident. To address these challenges, we suggest a three-pronged approach. First, by shortening and simplifying the questions it is hoped that they will be easier to ask and by inserting them within the general health checklist or screening tool, they will become part of a holistic approach, so that mental health may be seen as part of general health. Second, a training guide will be developed in order to explain the reason for asking these questions and also to provide prompts to follow should an answer require more in-depth exploration. It is hoped that this will empower the health workers and increase their confidence in asking the additional questions. Third, the next step would be to identify the resources in the community that provide health care, such as NGOs of which there are a great number, but each working in parallel and often in isolation. There is a surprising level of activity on the ground that has not been noted by academic institutions and government structures. These organizations need to be identified, described, and then mapped, so that the community health worker has service providers at hand to which parents and infants can be referred to receive help. Given the above three approaches, it is hoped that some of the challenges will be overcome. We thank Edna Arends, Assistant Director, Western Cape Provincial Health Maternal and Newborn Health Program and Dr Janet Giddy, Khayelitsha and Eastern Substructure Maternal and Child Health Program for their collaboration and support in the integration of these screening questions into the development and implementation of new tools. Without their contribution the acceptability and feasibility of using these questions would never be known. Dollberg, D., Feldman, R., Keren, M., & Guedeney, A. (2006). Sustained withdrawal behaviour in clinic referred and nonreferred infants. Infant Mental Health Journal, 27:292-309. Field, T. M. (1992). Infants of depressed mothers. Development and Psychopathology, 4: 49-66. Guedeney A, Matthey S, Puura K. (2013). Social withdrawal behavior in infancy: A history of the concept and a review of published studies using the alarm distress baby scale. Infant Mental Health Journal; 34; 6: 516-31. Kaukonen P, Salmelin R, Luoma I, Puura K, Rutanen M, Pukuri T, Tamminen T. (2010). Child psychiatry in the Finnish health care reform: National criteria for treatment access. Health Policy 2010; 96; 1: 20-7. Köhler L. (1991). Infant Mortality: The Swedish Experience. Annual Review of Public Health; Vol. 12: 177-193. Lopes S, Ricas J, Mancini MC.(2008). Evaluation of the psychometric properties of the Alarm Distress BaBy Scale among 122 Brazilian children. Infant Mental Health Journal; 29(2), 153–173. Luoma I, Puura K, Mäntymaa M, Latva R, Salmelin R, Tamminen T. (2013). Fathers’ postnatal depressive and anxiety symptoms: an exploration of links with paternal, maternal, infant and family factors. Nord J Psychiatry; 67; 6: 407-13. Matthey S, Guedeney A, Starakis N, Barnett B. (2005). Assessing social behaviour of infants: Use of the ADBB Scale and relationship to mother´s mood. Infant Mental Health Journal; 26: 442-458. Mäntymaa M, Puura K, Luoma I, Kaukonen P, Salmelin R, Tamminen T. (2008). Infants’ social withdrawal and parents’ mental health. Infant Behavior and Development; 31: 606-13. Mäntymaa M, Puura K, Latva R, Luoma I, Salmelin RK, Helminen M, Tamminen T. (2015). Shared pleasure in early mother-infant interaction: predicting later emotional and behavioral problems in the child and buffering the influence of parental psychopathology. Infant Mental Health Journal; 36; 2; 223–237. Patel V, Rahman A, Jacob KS, Hughes M. (2004). Effect of maternal mental health on infant growth in low income countries: new evidence from South Asia. British Medical Journal; 328:820–3. Puura K, Guedeney A, Mäntymaa M, Tamminen T. (2007). Detecting infants in need: Are complicated measures really necessary? Infant Mental Health Journal; 28(4): 409-21. Puura K, Mäntymaa M, Luoma I, Kaukonen P, Guedeney A, Salmelin R, Tamminen T. (2010). Infants’ social withdrawal symptoms assessed with a direct infant observation method in primary health care. Infant Behavior and Development; 33; 4: 579-88. Puura K, Mäntymaa M, Leppänen J, Peltola M, Salmelin R, Luoma I, Latva R, Tamminen T. (2013). Associations between maternal interaction behavior, maternal perception of infant temperament, and infant social withdrawal. Infant Mental Health Journal; 34(6): 586-93. Puura K, Tamminen T. (2016). Pikkulapsipsykiatria – ei tarua vaan todellisuutta (Infant psychiatry – not fiction but reality). Lääketieteellinen Aikakauskirja Duodecim; 132(10):951-9. Surkan P J, Patel S A, Rahaman A (2016). Preventing infant and child morbidigy and mortality due to maternal depression. Best Practice & Research Clinical Obstetrics and Gynaecology. Article in Press. Walker S P, Wachs, T D, Meeks Gardner J, Lozoff B, Wasserman G A, Pollitt E. (2007). Child development: Risk factors for adverse outcomes in developing countries. The Lancet; 369, 145‒157.